Many home cooks avoid purchasing and cooking live shellfish and crustaceans because they don't know how to prepare them, they are afraid of food-borne illness or even because they don't want to kill the animal during the cooking process. Crayfish are a good place to start your adventure with cooking because they are small and easier to handle than lobster and less likely to have issues with food safety than shellfish. You can even purchase frozen crayfish meat if you are faint of heart, but fresh crayfish provide the sweetest and juiciest meat. Place the crayfish on the sheet pan and sort through them, keeping your fingers away from the pincers. Discard any dead crayfish. Add 4 q of water to a stockpot. Add the seasonings and bring the water to a boil over high heat. 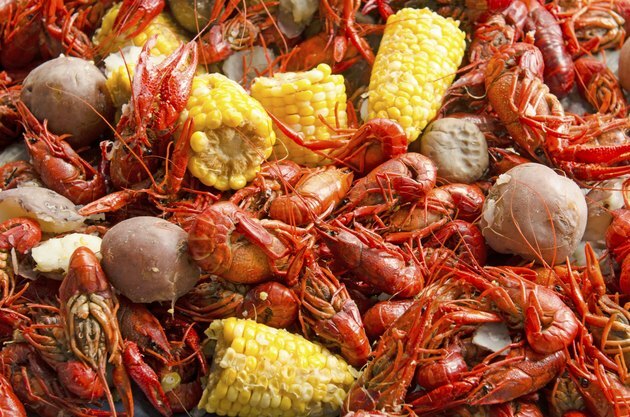 Drop the crayfish in with your tongs and boil them for 2 to 5 minutes. When the crayfish have all died and turned bright red, they are done. Serve the crayfish whole or twist off the tails, remove the appendages and crack the tail to extract the meat. The meat can be served in a seafood salad or in dishes such as crayfish etouffee. Heat the olive oil over high heat in a cast iron skillet. Add the carrots, onions and celery and sauté until the vegetables are soft. Add the crayfish to the pan with your tongs and sauté them until they have all turned bright red. Remove the crayfish from the pan and serve them hot in the shell, or allow them to cool slightly and twist the tail off and extract the tail meat. Save the shells and boil them for an hour to extract their savory flavor. Add 2 tbsp. flour to thicken the sauce and remove the shells. Simmer over high heat until the sauce has reduced and is your desired consistency.